This week’s installment on The Bay’s festive window displays focuses on a circus ringmaster and his ensemble of performers. This display is notable for its palette of saturated reds. Red is an advancing colour, which means it appears to “pop” or advance towards us. Red is associated with excitement, romance, passion, and last but not least, Christmas. Gold is used as a supporting colour, embellishing the dominant red tones and giving the eye a bit of diversion. The ringmaster is in the middle of his speech, announcing the next performance to eager spectators who are looking forward to another lavish spectacle. His right hand holds a bullhorn, and both hands are thrust upwards to grab the crowd’s attention. Next to the ringmaster is a rotating platform with three Victorian era carriages pulled by a steam locomotive. 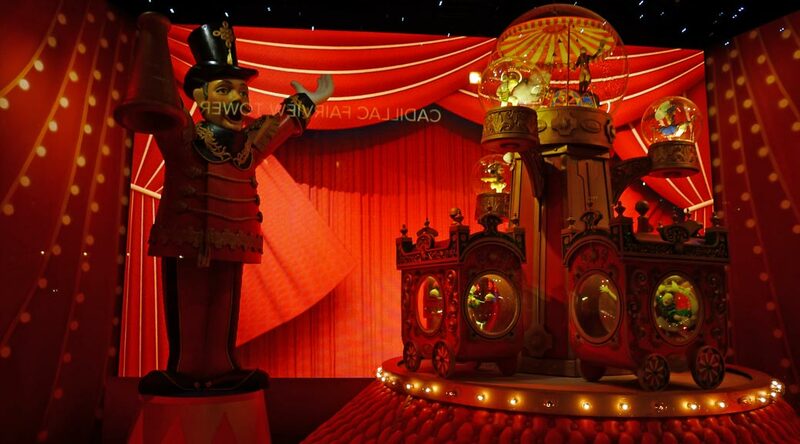 Each carriage contains a diorama of circus performers within. On the central pedestal, several small transparent globes circle a larger globe, each containing additional vignettes of circus performers. So what we have is several small dioramas within a large one, making this a very unique display.